Every Sunday at 5pm, Quaker Concern for Animals holds an interfaith or no faith meditation for named/unnamed non-human animals. Wherever we live, we hold them all in healing love and light. Our meditation group was initiated by QCA member Elizabeth Rowland Elliott in response to the plight of Tony, a Siberian Bengal tiger held captive in the Tiger Truck Stop parking lot in Grosse Tete, Louisiana. For more than seven years, individuals, groups, sanctuaries and professional organisations continued a robust campaign to free Tony. 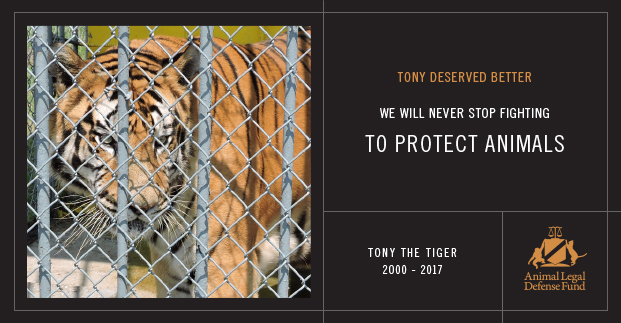 Among them was the Animal Legal Defense Fund (ALDF) which successfully obtained a judgement prohibiting Louisiana from issuing any future permits for Tony’s captivity. Devastatingly, however, the Louisiana legislature passed a law exempting the Tiger Truck Stop—and the Tiger Truck Stop alone—from the Louisiana Big Cat Ban, undoing the ADLF victory in court and trapping Tony at the truck stop. We are deeply saddened to hear that Tony was euthanised, due to ill health, on Monday 16 October aged 17. However, there is comfort in his final release and we hold him in the light. We are comforted, too, in knowing that many are fighting on in Tony’s memory. We continue to hold other named animals in healing love and light who are currently suffering in captivity. We also know of many animals who have reached sanctuary since our group began, including 50 year-old Raju, and partially blind Mohan, former Indian working elephants now leading peaceful lives of freedom and safety at the Wildlife SOS Elephant Conservation and Care Centre in Mathura. Friends who would like to join with us in our Sunday meditation are asked to send a message to our Clerk through our contact form.